What would you think if I said that all you need for your waterfowl shooting is a 28ga? Most would think me crazy or just stupid. However, that is just what I am proposing . Using hevi shot with the proper choke and pellet size this smallbore can and will handle all of your waterfowling needs. My son and I have both been shooting 28s this year and are amazed at the results. Using 71/2 shot @ 1350fps we have been able to consistently kill mallards @ 55+ yards. Does anyone have similar experiences with hevi shot or are we just lucky? 7 1/2 shot seems pretty light for ducks. I'd think 6's would be minimum for ducks although I prefer 4's. Guess it depends on how and where you hunt. If you are able to decoy them in for really close shots I can see where a lighter pellet might work as well. My shots tend to be longer so I like the down range Oomph a heavier pellet provides. 28GA's are pretty nifty though for Doves and Grouse. 7 1/2's do seem pretty light to me too.....Also the velocity seems a little off What company ammo OR what reload recipe, gun, and choke tube are you using? My pellets seem to bounce off (but still hit) grouce at 60+ yards when i was using a Modified choke and high brass Federal ammo? I did try others as well, and found the next closest to Federal to be Fiocchi Hunting Loads in HV 7 1/2's . guys I'm really not pulling your leg. This Hevi shot is amazing. It is actually heavier than lead. With lead I would totally agree with #6 shot but with this stuff the 71/2 does what the #6 used to. My friend uses 9's for the shots over decoys. And we use the #5's for geese. The choke is the key to it I am using only .008 constriction this stuff does not need much choke. I'll dig out some of the record and give you the pattern counts. 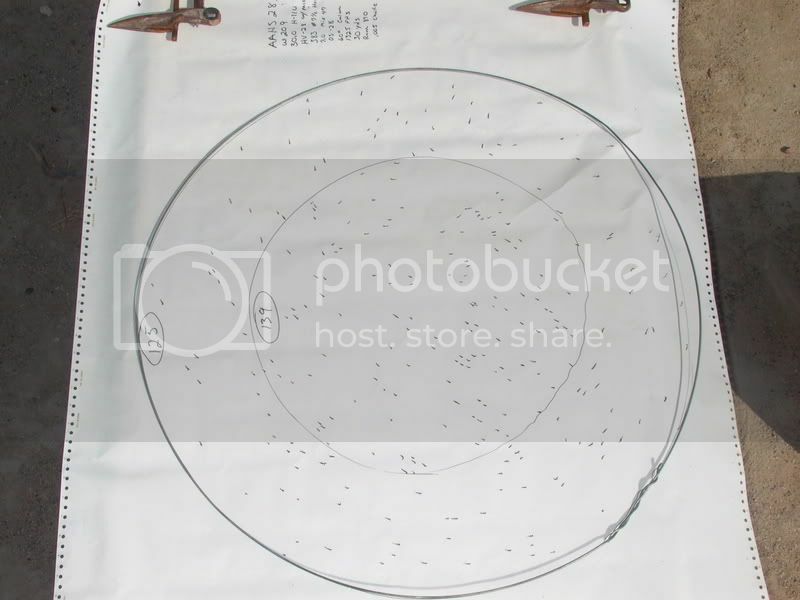 Here is a pic of the pattern of my latest 28ga hevi-shot load. 7/8oz of # 71/2 shot. This was shot @ 30 yds with a .005 choke and is about 94%. I don't mean to put you down but waterfowl hunting has been my main hunting game for over 45yrs. If you would make a statement in a gun shop like you did in your post, the guys would roll their eyes, and pretty much ignore anything that you said from then on. 55yd shots with even a 10ga shotgun with the shot now days are not done all of the time. I still use my old Browning Auto-5 2 3/4" for ducks. I don't shoot anything much over 35yds. A 50+yd shot is not done my anybody in my blind because of cripples, even with my polished Lab at my side. I use full choke with either steel #2 or #4 shot. I won't even start to get into the ballistics downrange of a 28ga because it's just too foolish to even get into that discussion. The 28ga is a fine gun, and was developed for upland game, not ducks using 7 1/2 shot. In all of my years of duck hunting over a large part of North America, I have never seen or even heard of a hunter using a 28ga for ducks. If you can do this with your 28ga, please give me a p.m. so I can give you my address so you can send me your picture and autograph. Heres my first thought, you must drive a foreign made car and hunt the firing line somewhere. I have been hunting and shooting along time and have never heard anything that stupid in my life, you couldnt kill a mouse with that at that range much less a duck or goose. I am one of the few people on here that can say they have been shot with 7 1/2 shot from a 12 guage (the sporting clays course was facing the wrong way) and guess what it didnt even penetrage through my shammy shirt (someone I know very much on here can vouch for that one). I work at a gun club that holds any oakleys every thursday night. When the third shooter breaks a bird 5 ft off the ground at 60 yrds that is one heck of a shot and 90 % of the time its a quarter sized chip and it dont happen to often, and those are 12 guages with full chokes. What you speek of is impossible, you got a better chance with a .22 long rifle. Like stated earlier I want to see some pics and I want to see a plucked duck or goose with pellet entry holes. Or a video. First, my apologies, My statement about 55 yards was intended to draw some reactions. My ability to HIT a duck that far is very limited, the ballistic performance and shot pattern is perfectly adequate for the job. Three of these geese were not taken with a 28ga it was with a 410. Ranges were from 15 to 50 yards. This was all done with 28ga's at ranges from 20 to 50 yards. I know that my description of the ballistic performance of Hevi-shot sounds unlikely but if you run it through Lowrys calculator you will see that it works. At a density of 12gms per CC it is substantally heavier than lead. OK Dennis, you got me. I'm wrong. An old guy can learn something new every day. I'm heading out to Gander Mountain right now and getting a 28ga for the longer shots that my 12ga can't do, and I'm even buying a BB gun for even longer shots than that. Will be trying them on Geese in the morning. Have a good hunting season. I'm not trying to prove that the 28 is better than a 12, just that it is adequate for a lot of waterfowling. I would like to have a discussion about what is required to kill ducks and various ways to get there. Sometimes what we think we know about the 28 can be turned upside down. It sure was for me when I was introduced to small bores. I know a guy that guides for geese from north jersey and from what I understand, he uses a 20 ga. with steel and he does great. That may be just for ducks but I think he uses it for geese as well. Remington claims 60 yd shots with it's new Wingmaster HD. For around $30-$40 a box of 10 it better do something magical. That's $3-$4 every time you pull the trigger at a duck! I've seen a 20ga do good work for ducks before. My friend used a full choke, and only took close shots, and used the 20ga 3"Mag. That load is pretty close to a 2 3/4" 12ga. He shot quite a few ducks the day that he was with me. I think you are missing the point that he is using hevi shot. That stuff is amazing for knock down and penetration over what you are used to thinking about. You still have to be able to lead the target well enough an make the hit but I am not doubting the long range knock down of the Hevi shot. (For what you pay for it it should dress out the ducks for you too! )Plus with the smaller shot you get more pellets in the pattern. I am going to try some of the coyote loads they make for night hunting this winter too. I have no doubt about the effects of heavy shot at long range. I just question a guy saying that he is killing geese and ducks at 55+ yds regularly with any shotgun much less a 28ga. There just isn't enough shot in the 28ga for that. Also, you need a lot of 7 1/2 shot to kill a duck. It takes several #4s generally to get a clean kill. To top that off, at ANY range with a wind, your shot pattern will be blown all over the place using the loads that this guy says that he is using. When a guy brings up something like what his first post said, I can only think of my favorite sarcastic expression, " Let's talk dumb for a while"
Anybody that knows anything about the duck blind other than an intellectual theologian, wouldn't consider using a 28ga, much less telling the world about it. I agree with you Dawgdad on the price of that stuff. I like the high speed $9.00 per box Steel #4s or #2s using my full choke. I used to pull some long shots with my old lead 1 1/2oz reloads. Around 45yds once in a while. 36gr of Blue Dot with 1 1/2oz of #2s. Boy for the good old days.